In December of 2018 I made the bold move (for me anyway) to enter in a game jam. This game jam to be precise. The 2-Buttons Jam 2018. I’ve been a user of Unity since 2010 and made my first unity “game” by remixing the old island demo project into a crude fps with robots and a gun that shot red spheres. I thought I was pretty cool. Since then I’ve made countless small demos and projects for my own enjoyment but have never released something playable to the public. Since then, despite my dream of making games someday for a living, my biggest failure and personal weakness has been my creative hesitancy. The fear of putting something out and having people not like it. But something about the end of the year made me want to submit something for the first time. I’ve been closely following the game jam scene hosted on Itch.io and have patiently watched many great jams come and go telling myself I will join one of them someday. Two things about the the 2-Button jam made me intrigued enough to join finally. The premise of using only 2 buttons for gameplay, and embracing accessibility as a core feature of my games. Use 2, and only 2 buttons, for everything about the game. That’s the challenge. From the menus to the actual gameplay. I love this restriction. I also wanted to challenge myself by creating a fiarly complex game and constantly asking myself, does this need it’s own feature? What decisions can I take away from the player that won’t affect their freedom of choice and keep things fun? For me, this meant trying to make a game in a genre I absolutely love, top down space shooters, all while keeping true to the challenge of a two button game. Thus Rogue Void was born. I love top down space shooters. In particular, Sinistar, Armada for the Dreamcast, and AirMech Arena more recently. 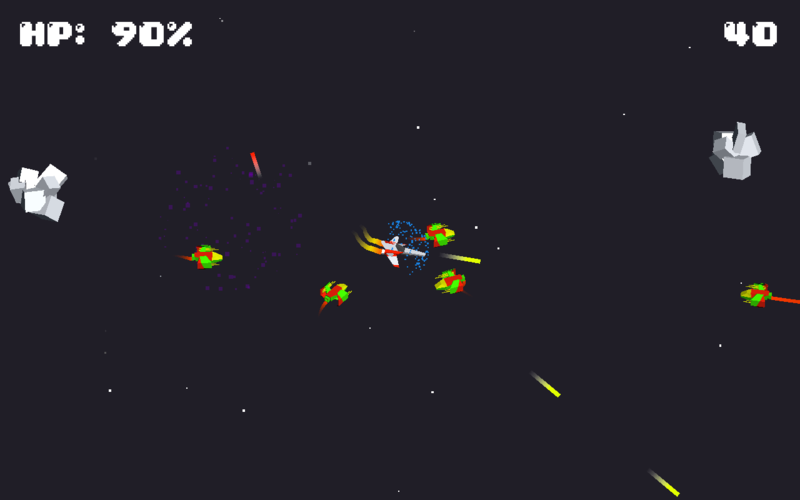 These are fun, open spaces, that blend bullet hell gameplay with some fun physics. I decided to remove a big element of these games from the player control. The ability to control when the player fires their weapon. For me, if there were enough enemies on screen, the player would never want to stop shooting. Bonus, if you make the shooting satisfying and fun, they would be looking to shoot more (cue hints from 2016 Doom). So I made the player constantly shoot while in the “Void” or my version of the kind of battlefield where the player would fight. In the hub world, there was no reason to shoot, so in the hub areas the player would simply fly around without firing a single shot. My second reason for attempting a two button challenge is that I generally believe in attempting to improve accessibility in gaming. I know games are hard to make and they are hard to make well, but I also understand the frustration of not being able to play a game. As a kid of seeing a game out that I didn’t have the money to buy was awful. That yearning to get my hands on the latest game was agonizing at times. I cannot imagine how terrible it must feel to have both the money and time to play a great game, but be denied due to accessibility issues. I’m always excited to hear about games including more accessibility features. Unity makes it fairly easy to remap input. Using only 2 buttons makes this process even easier. especially for mobile. Left side and right side. That’s it. Rogue Void is the first step, more like a proof of concept, for a larger game I hope to make in the future. I love the idea of procedural worlds and “runs” being fashioned for players to delve into. Combining the fun of a fast-paced bullet hell with rogue-like forays into new and hostile environments. It was a blast to spend 4 days making the game. I put altogether probably 30+ hours into the project and am pleased with the result. Of course, there are many things I hope to include someday. But getting it out of the door was a major step both as a hopeful game developer and from an emotional standpoint.